The state Transportation Commission will be talking ferry fare increases during its monthly meeting Tuesday in Olympia. Generally, there’s a 2.5 percent “cost-of-living” increase every Oct. 1. It was different last year, when it happened early, on May 1, to offset revenue lost from expanding the youth discount from 20 percent to 50 percent. Vehicles took a 2.5 percent hit, but passengers got off with 2 percent. A 2.5 percent hike is assumed in the House and Senate transportation budgets that need to be consolidated and passed soon. The ferry fare discussion is on the agenda for 4 p.m. to 4:45 p.m. You can watch it on TVW. Two routes would have made money last fiscal year (July 1, 2013-June 30, 2014) if Washington State Ferries wasn’t viewed as a system. Edmonds-Kingston collected 106.7 percent of its operating costs, and Seattle-Bainbridge 106.1 percent. Overall, fares covered 69.2 of the system’s operations. When the second new 144-car ferry, Samish, joins the Anacortes-San Juans route on June 14, it will domino other boats to new assignments. 144-car Hyak will move from the San Juans to Bremerton. It will replace sister ship Kaleetan, which goes to dry dock until mid-September. The 90-car Sealth goes from the San Juans to Fauntleroy-Vashon-Southworth, bumping 87-car Evergreen State to standby, along with sister Tillikum. Bainbridge: 202 car Wenatchee and Kingston’s 202-car Puyallup because 202-car Tacoma will be in dry dock all summer. Kingston: 188-car Spokane and Bremerton’s 188-car Walla Walla. Southworth: 124-car Issaquah, 124-car Cathlamet and 90-car Sealth. The state is installing ramp meters between Olympia and Tacoma to ease chronic congestion on I-5 around Joint Base Lewis-McChord until more lanes can be built, which might never happen. 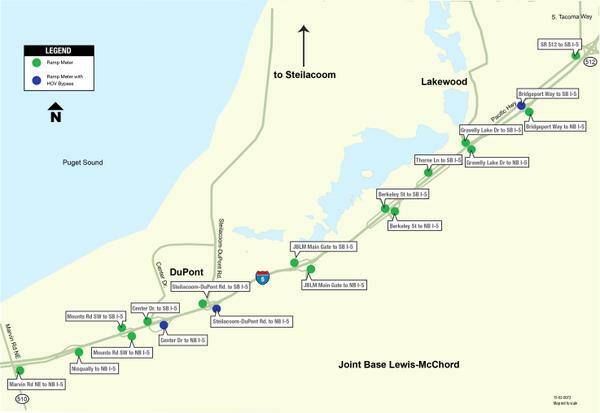 The Department of Transportation will have meters at 11 interchanges near Joint Base Lewis-McChord where traffic routinely slows to a crawl during the morning and afternoon commutes. They could be flashing as soon as May 18. New ramp meters, traffic cameras, and variable-message and travel-time signs are part of a federally funded project designed to help alleviate congestion through this corridor by better managing traffic. I won’t bother telling you where they’ll all be, or are. Three are already operating. Just know if you’re entering the freeway, you’ll probably have to stop first. The meters help reduce congestion by providing timed intervals between vehicles, instead of allowing multiple cars to enter the freeway at once. Studies show that they reduce collisions by as much as 30 percent. Before the new Narrows Bridge opened, they put the meters on five or six of the ramps heading toward Tacoma, and cameras too so you could look online and see how bad things were before you got there. I didn’t notice a ton of difference, but maybe that’s just me. They turned them off when the new bridge broke the traffic jam, but they’re still there and might be needed later. I can’t think of many places where on-ramp meters would make a big difference in Kitsap. What do you think? A Kitsap Transit lobbyist told the board Tuesday he’s not optimistic the Legislature can complete its work during the 30-day special session that began April 29. Everything is being held up by disagreements between the House and Senate over an operating budget that must include a huge chunk of Supreme Court-mandated education funding, said Dylan Doty. Only when that is resolved can lawmakers move on to construction and transportation budgets, and a transportation revenue package. Doty predicts a second special session will be needed, which could extend into June. The ultimate deadline is the end of the state fiscal year June 30, when the government would shut down. Transportation chairs Judy Clibborn, D-Mercer Island, and Curtis King, R-Yakima, have been meeting regularly about transportation revenue project lists and reforms, Doty said. They’re close on the projects. The holdup, like last year, is reforms, including keeping sales taxes from projects in the transportation budget instead of the general fund as is done now. Kitsap Transit has much to gain from a transportation revenue package, including money for new Silverdale and East Bremerton transfer centers that is on both project lists. Also mixed up with the package is House Bill 1221. It would, with voter approval, allow Kitsap Transit to create one or more passenger-only ferry districts funded by up to three-tenths of 1 percent of local sales tax. The transit board on Tuesday approved a $312,000 contract to move ahead with Phase 2 of the cross-Sound passenger-only ferry business plan, which includes engaging the community about it. Until the bill’s fate is known, however, there are some questions about what to tell people. But the agency should share what it knows, said South Kitsap resident Roger Gay and a couple board members. Some Kitsap County kids will be disappointed if it doesn’t snow next winter, and it won’t be just because they don’t get to skip school. 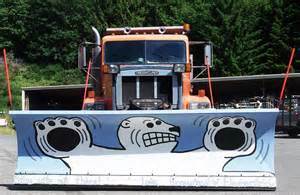 As part of the annual National Public Works Week celebration (May 17-23), Kitsap County Public Works has announced a contest to select three classrooms to paint the blades of snowplows used in snow and ice removal operations. The contest is open to classrooms at all levels. Public Works will provide the paint and brushes, and arrange delivery and pick up of the plow blade with the selected schools. The blades are 12 feet long and about 3 feet high. Applications and photos of last year’s entrants are available at http://kitsapgov.com/press/2015/NR15-040.htm.